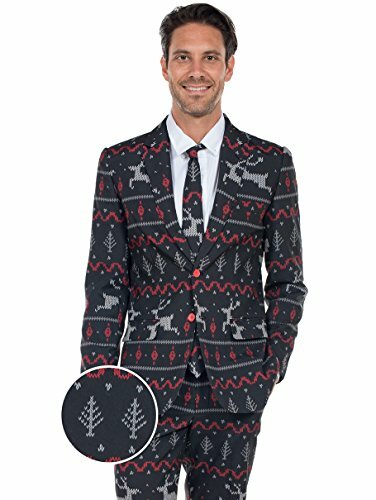 The perfect versatile party suit for any dress-up occasion: Whether it's your office Christmas/Christmas party or a festive dress-up with your friends and family, our quality stylish suit ensemble is the ideal accompaniment to create a fun-filled and memorable occasion. 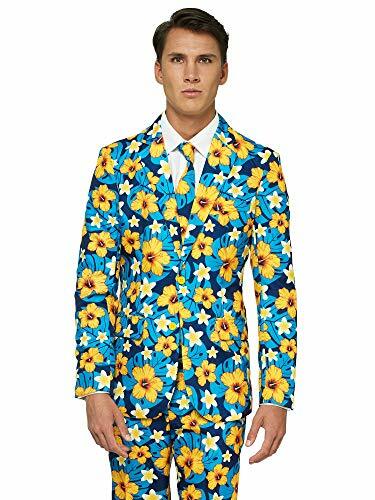 Regular fit suit made from premium fabric, featuring unique and playful design: Constructed from a light and breathable 100% quality polyester fabric, our suit jacket features two side pockets, peak lapels and inner side vents. The trousers come with a zip fly and a button adjustable elastic waistband for relaxed comfort and fit. Designed for easy care and convenience: Our suits are machine washable for the ultimate in hassle-free care and convenience. Specifications: Condition: Brand new with tags Fitting: Regular Material: 100% polyester Size: Please refer to the size chart on the left picture. Package includes: 1* upper garment 1* trousers 1* tie Best quality and service for your peace of mind: We are committed to providing our customers with the finest quality products at affordable prices. If for any reason you are not satisfied with your purchase, please contact us and our experienced customer services team is happy to help you as quickly as possible. Does your leisure in summer and spring usually consist of having fun in the sun? 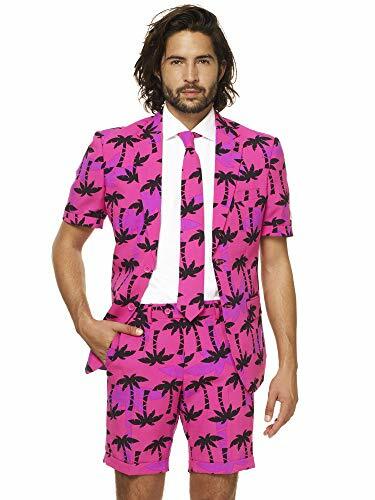 Well, let's celebrate the warm seasons in style with a short suit for yourself (or for him). 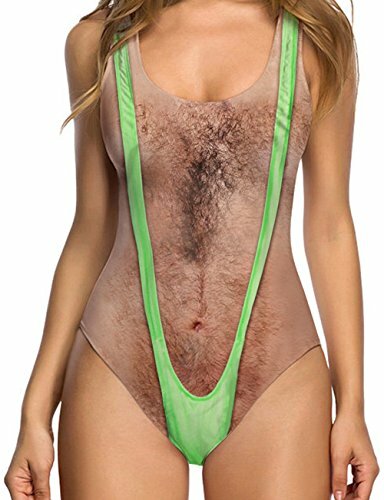 Thanks to this fun attire, you'll finally be able to show your crazy and stylish sides at the same time! So get yourself this beauty and be prepared for many high fives and fist bumps. Ho Ho Ho and Merry Christmas! 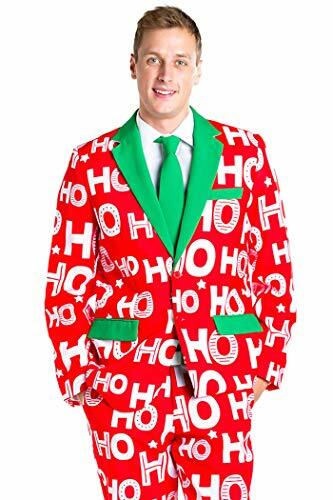 This Red and green Christmas suit features the words Ho Ho Ho in a repeating pattern across the entire Xmas suit. 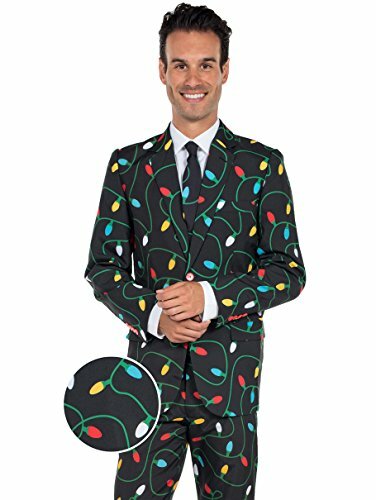 If you are looking to make a splash at your Ugly christmas sweater party this is just the Christmas suit for you!